Sault Ste. 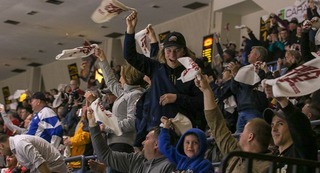 Marie, ON – On Friday night, the Saginaw Spirit (29-31-9-0) traveled to Sault Ste. Marie to face the Greyhounds (56-7-3-3). 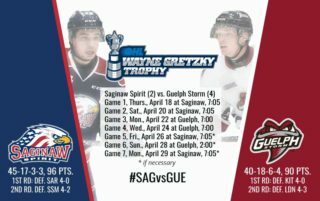 This game marked the first West Conference Quarter final between the Soo and Saginaw. Spirit goaltender and New Jersey Devils prospect Evan Cormier made his ninth OHL playoff appearance. The Spirit’s energy and pace shined in the first 40 minutes of play, but ended in a 5-2 loss to the Soo. 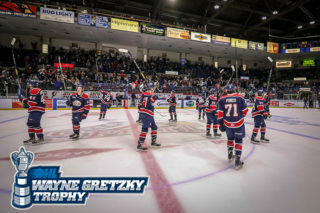 In the first frame, Damien Giroux started the Spirit’s scoring opportunity as he cut to net to face Los Angleles Kings prospect Matthew Villalta but was hooked by Conor Timmins. Following the Timmins penalty, a Spirit penalty was called resulting in 4-on-4 hockey for 50 seconds. With two Spirit players tangled up at the blueline Metamora, Michigan Native Jack Kopacka took off on a breakaway to face Cormier. With no Spirit defense in his path Kopacka was able to beat Cormier on his stick side for the first goal o the game at 2:53. With a power play at 14:43 the Spirit took every opportunity they had to keep Villalta on his toes. With a tightly contested battle the Spirit ended the first period down 1-0, but outshot the Hounds 12 shots to 11. The Spirit entered the second period committed to blocking shots and protecting Evan Cormier. Cole Coskey got the puck from Jake Goldowski on the inside and was able to beat Villalta over the right pad at 6:14 to tie the game 1-1. 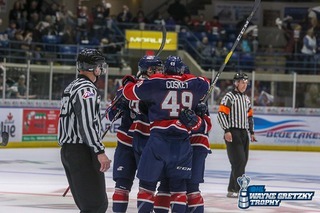 This was Coskey’s first career OHL playoff goal. With no penalty after Mason Kohn was interfered with on two occasions, the Spirit bench began to get heated. On the right wing side Tampa Bay Lightning prospect Taylor Raddysh beat Cormier on the short side to take a 2-1 lead at 15:57. With the attention on the Spirit bench Raddysh was able to get the puck past Cormier on the glove side for the Hounds first two goal lead of the game. A penalty on Kopacka with two seconds remaining in the second period would mean the Spirit would start the third with a one-man advantage. The Spirit was unable to capitalize on a goal during the 1:58 power play that started the third period. 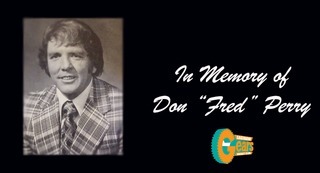 At 7:14 a long shot ricocheted off the boards and then bounced off the back of Cormier’s pads for a 4-1 lead for the Soo. A pass across the Spirit zone gave Kopacka the chance to fire a shot at Cormier. Brighton Michigan Native Keeghan Howdeshell tipped in the shot by Kopacka for the Soo’s fifth goal of the game. A shot by Ryan Stepien slithered through Matthew Villalta to get the Spirit their second goal of the game. The final decision ended in a 5-2 Spirit loss. 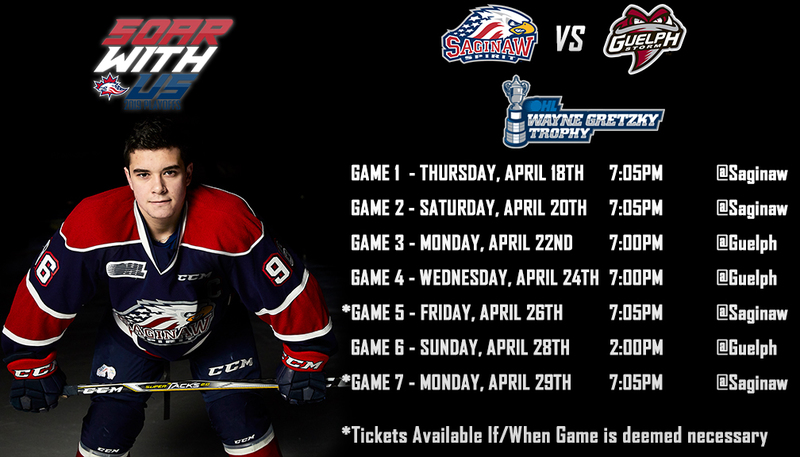 The Saginaw Spirit (29-31-9-0, 67 points, 8th in Western Conference) will face the Sault Ste. Marie Greyhounds (56-7-3-3, 116 points, 1st in Western Conference) at Essar Centre on Sunday, March 25th for the second game West Conference Quarter final. The puck drops at 3:00 p.m.